The number of international patent applications submitted to the World Intellectual Property Organization (WIPO) reached 218,000 last year, setting a new record, according to a press release of WIPO on March 16. Regarding numbers of filed patents, by country, the United States remained the largest, while China saw the fastest growth; by enterprise, Huawei Technology retained its leading position among global enterprises. In 2015, the United States submitted a total of about 57,400 applications, followed by Japan and China with about 44,200 and 29,800 applications filed, respectively. According to WIPO, China, South Korea and Israel saw the biggest growth in patent applications last year, with respective increase rates being 16.8%, 11.5% and 7.4%. Among enterprises, Huawei ranked first for the second year with 3,898 applications, followed by Qualcomm with 2,442 applications and China's ZTE with 2,155 applications. According to the 2015 annual report of the European Patent Office (EPO), Huawei ranks ninth in Europe with 498 granted applications, and remains among the top 10 in Europe with this number. In the 2015 European Patent Application rankings, Huawei was fourth with 1,953 patent applications, and first with 1,197 patent applications in the digital communications field in terms of differentiation techniques. 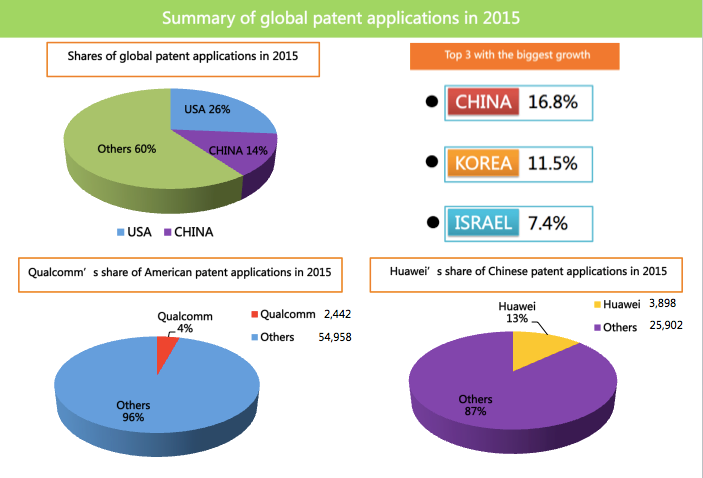 At present, Huawei is growing steadily with an annual increase of 1,300 patent applications globally. 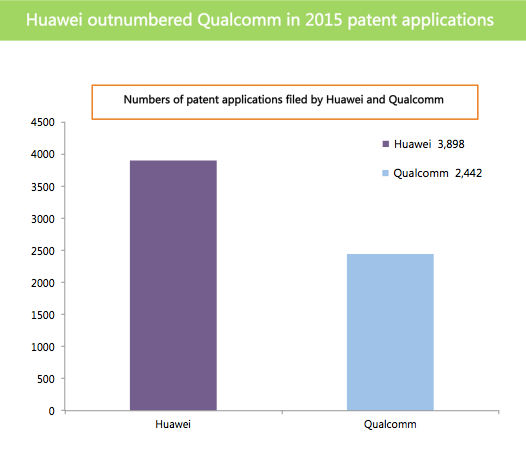 Possession of high-quality patents is the engine to drive Huawei forward. Patent applications on their own do not give the applicant any advantages, as only granted patents can be used to protect interests. In fact, in international patent litigation cases only patents granted overseas can be considered as the legal basis. Over the past few decades, Huawei has accumulated a leading number of overseas patents. By 2015, Huawei Consumer BG had more than 9,000 global patent applications, including more than 2,000 patents obtained in China and 1,100 in overseas areas like Europe, America and other regions. Wishing Huawei All the very best in all their future endeavors.